I ended part 1 not in the best of shape and about to enter my first dungeon. 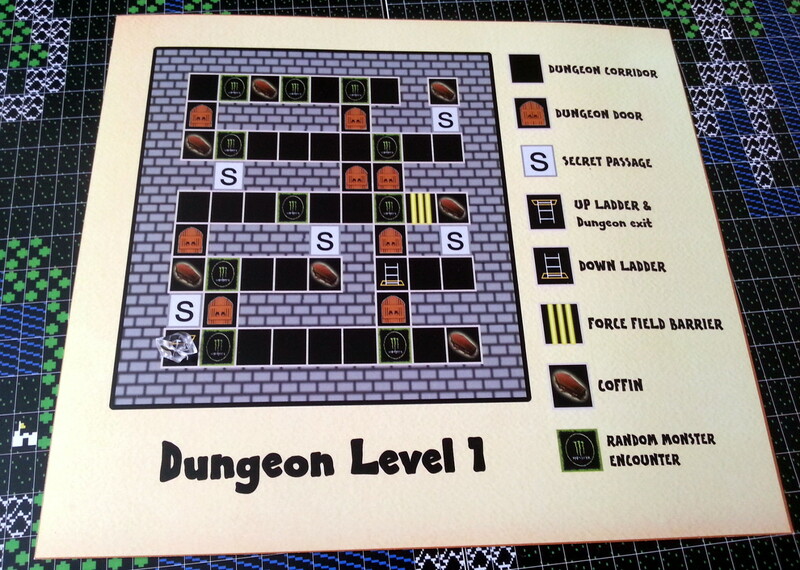 In this version of the game the dungeons are all 10 levels deep with the 1st, 5th and 10th level all being the same every time. The other levels are randomised when entering but I skipped that part since I have no intention of going down to level 2 at this stage. In terms of the mechanics as I understand them, the M squares each have a random monster encounter. 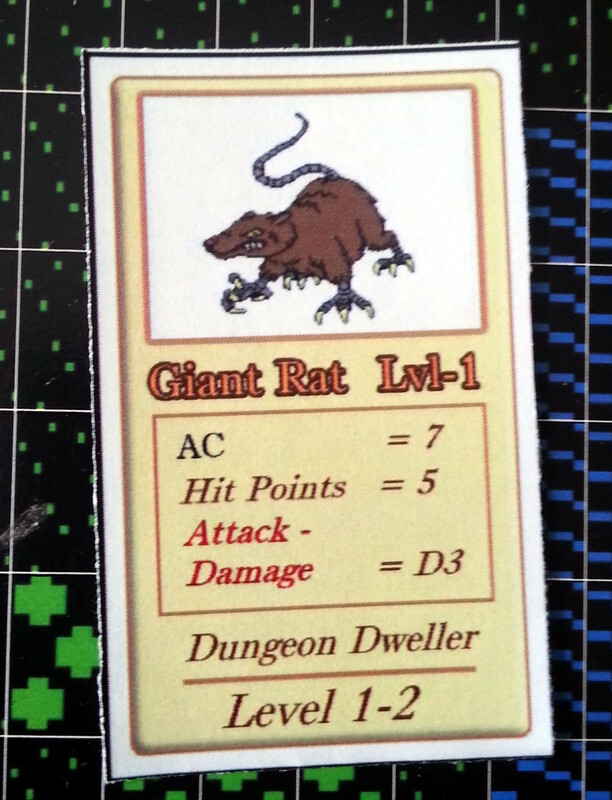 There are dungeon monster cards for each pair of levels with progressively tougher critters as you get deeper. I’m assuming for my playthrough here that these encounters happen every time you step on a square no matter how many times you’ve been here before. The doors are locked and can be picked, magically unlocked or bashed through depending what your characters abilities are. I’m guessing that I can keep retrying any of these at the expense of food if I don’t succeed the first time. The secret passages can only be seen based on a roll of a dice also. Again, I suppose I can just stand there and keep rolling until I see the way through so these mechanics would come into play more when running away from monsters. The coffins all contain treasure allowing me to draw a coffin card to see how much is in it when I open one. They can be trapped however with the amount of damage I take based on the level of the dungeon if I can’t disarm the trap. The manual has an example for how much damage I’d take on level 6 but I couldn’t see the formula for working this out so I may have to make something up when it comes to it. All of this is something of a moot point for now and I’ll save the proper dungeon exploration for later. I’m purely here to grind some GP and XP and since there is a monster square 1 move from the entrance I simply move back and forth onto this picking fights. 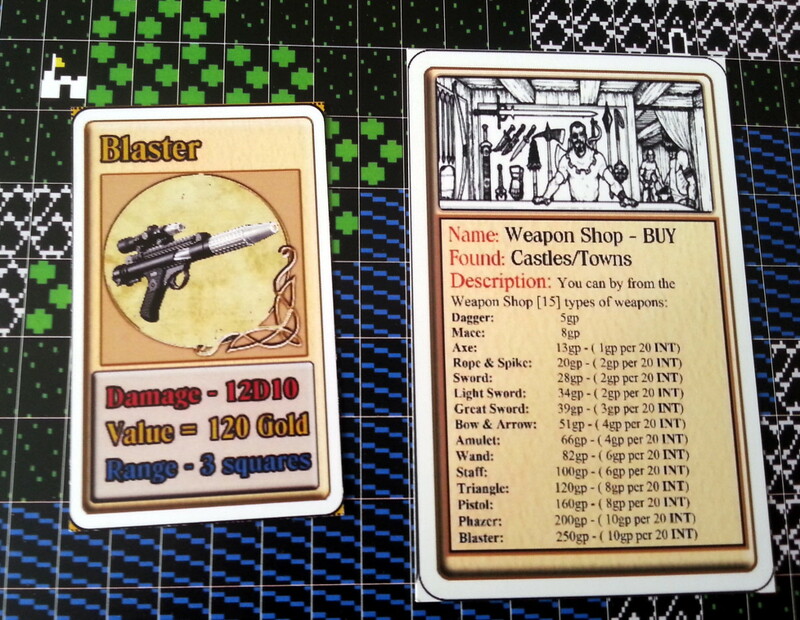 You may be able to tell the monster card is one I printed above as it’s on cheap paper and 1/4 of the size of the others. These level 1 dungeon monsters are similarly unimpressive compared to their wilderness counterparts and an easy fight even for my starting character. I pick off about 6 or 7 of them on my first go, every kill allowing me to draw a coffin cards worth of GP + I get double the monster HP added to my own when I exit the dungeon. Finally I’m starting to make some progress. I head back to town with the intention of buying food and HP when I happen to notice the price list for weapons and the fact that I now have enough gold to get the best weapon in the game for a bargain 250GP. There doesn’t appear to be any level restriction and this has to be better than walking back and forth between signposts so I go for this and opt for starvation rations instead. The instructions mention two types of weapon shop actually and which towns have which type of shop but I couldn’t see anything telling me exactly what the difference was so I’m just assuming they all sell everything for my purposes here. I still have a little money left for food but I’m not too happy about the price at 6 GP each given the dim-witted nature of my character at present. 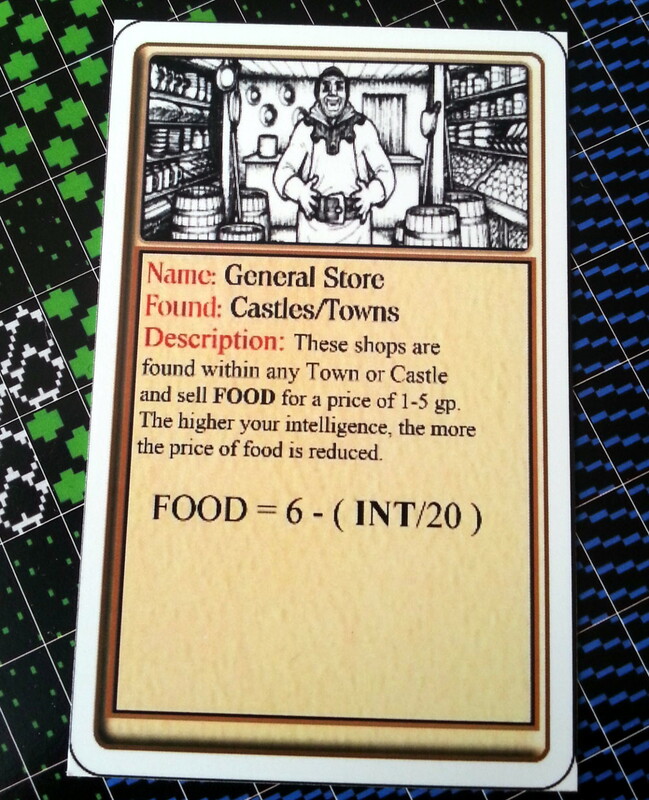 Food comes in packs of 10 in the game as I recall which would make more sense here but for now I opt instead for taking 1 HP damage every time I’m supposed to eat as it would be cheaper to just buy the HP from Lord British. 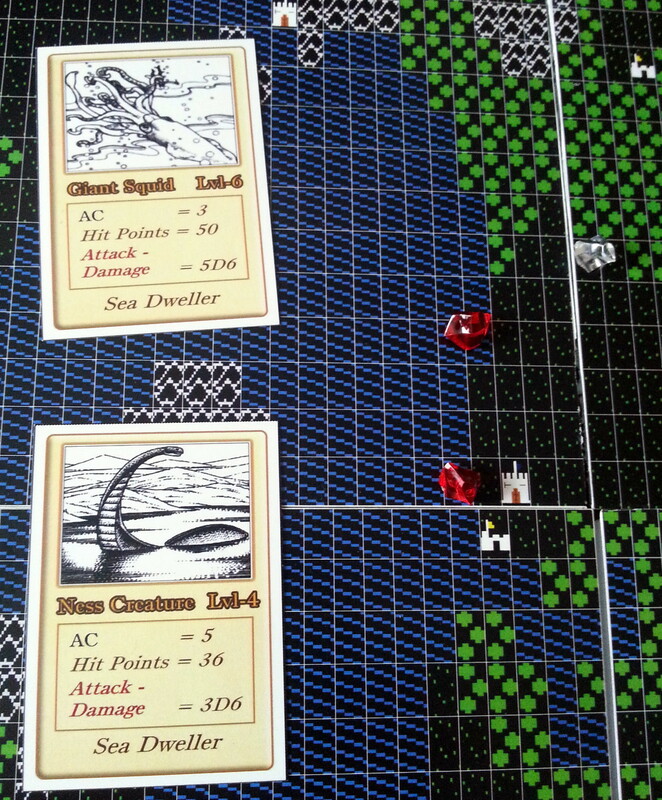 Up until this point I’ve been getting chased around the map by two sea monsters who both looked way out of my league. My new blaster allows me to pick both off from range with impunity then it’s back to the dungeon to bash my way through more level 1 monsters. I quickly work my way through all 15 of my level 1 cards several times with my new blaster taking out everything in a single hit when I score one. When I level up, my fighter character can roll one less on the D20 to score a hit in combat and I get to choose between a +1 damage or +1 to hit modifier. These modifiers are seriously unbalanced given my weapon already does 12 D10’s worth of damage and I fully intend to just go for the +1 to hit modifier at every level. 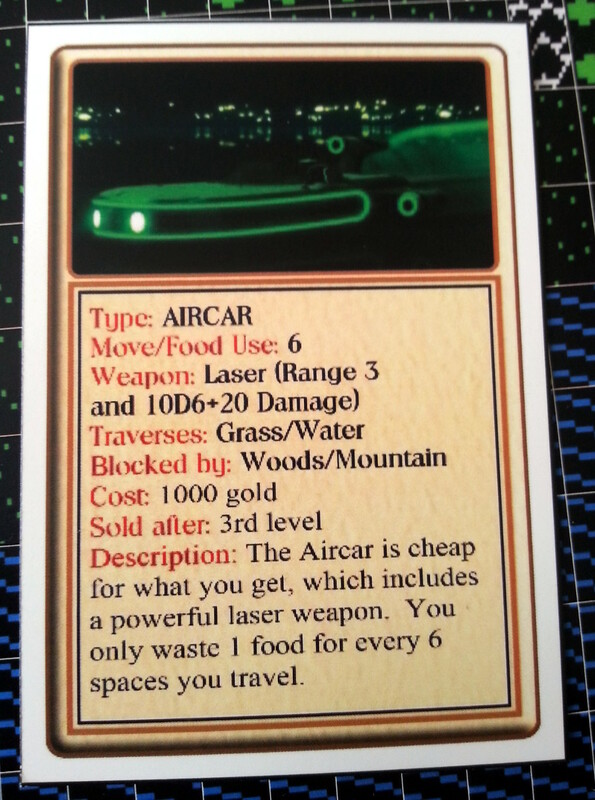 After several dungeon forays, I have just about enough gold and XP to buy myself an aircar which will save me some food and allow me to travel over water to the signposts and raise my stats. I’m not so convinced that most of the stats will be all that valuable from what I’m seeing but intelligence would get some of the shop prices down so I decide to work on that and conveniently I’m already on the right map to do it. I travel back and forth between signposts raising intelligence and agility. The signpost card says agility will help out in combat but I’ve not seen any sign of that so far. I’ll confess to getting quite lackadaisical about the mechanics of the game during this sort of grinding. It’s far quicker to just move roughly 12 squares, take off a couple of HP for lack of food, move the monsters a few squares (they move 1 for every 4 when I’m in an aircar) and generally not be too pedantic about being exact with any math that is needed. At the end of all this, my character is up to level 4 and a whole lot better off than he was in part 1. At level 4 the wilderness monsters double in frequency which may slow things down but I would guess that I’m closing in on the halfway point. I think it’s high time to get some better armour and then have a go at the quests. The game has become quite unbalanced today really since I got a decent weapon but the original game was as guilty of the same thing. It becomes more obvious when you are applying the rules manually but having peeked at the level 9 dungeon monster cards things will become a lot more challenging again later. This is definitely capturing the essence of Ultima 1 for me anyway but I do feel that my character stats should be involved in combat somehow. Unless I’m missing something I can’t see much incentive to raise them. I probably shouldn’t have been able to get that blaster so early on either but it has made progress a lot easier so I couldn’t turn it down. Some sort of stat restriction on which weapons were equipable or for sale would probably be a good idea as everyone will go straight to a blaster otherwise. After two decent length sessions, I still can’t say I’m convinced about this sort of single player RPG boardgame in general. I mean I’ve done some geeky things in my time but spending hours rolling unlikely shaped dice while playing this is right up there. While I clearly prefer my own variety of retro-gaming geekdom, I am still having some fun playing this as a one-off at any rate and am looking forward to getting properly stuck into the dungeons in part 3. This entry was posted in Ultima 1 by Pix. Bookmark the permalink. A: When in the dungeon and trying to unlock doors or disarm traps, if you fail to perform the task you can’t try again until you leave that dungeon level and return. So, no you can’t continue to try over and over to disarm a trap or bash a door or search for secret door. I will add this in the rules!!! A: Purchasing a phaser or blaster should have a level restrictions but I don’t know exactly what they would be in the game, do you? I will place it on the actual weapon card when I know! A: Yes, food is sold in packs of 10! Thanks for the clarifications. I’ll put them into practice for part 3 but I don’t think I’ll be handing my blaster back at this stage. As far as that goes I don’t recall any restriction on using a blaster. I’ve certainly never run into it and I’m sure I’ve read that you can potentially just steal one from a shop right at the start of the game if you are lucky (whether the shop sells them or not). I’ve always got it for free by using the signposts as soon as the aircar became available. As such, I’d put the restriction on when you can buy them if it was me to leave that option open to the player. Apple BASIC isn’t exactly my thing but assuming that the TIME variable is a count of moves made and that TN is the town number then it basically says you can buy a blaster if you’ve made more than 6000 moves and you are in an odd numbered town. I don’t imagine you want to start counting moves on the board game but 6000 moves equates to being a long way in from what I recall so I’d suggest level 6 maybe? I have been reading this series with great interest because I really want this to work out. One thing that took me by surprise is that this is a only a single player board game. Can that be fixed? My family has passed many hours on the board game version of Age Of Mythology and – while it does has some balance issues – is a heck of a good time. I am hopeful the same thing could be done with this. 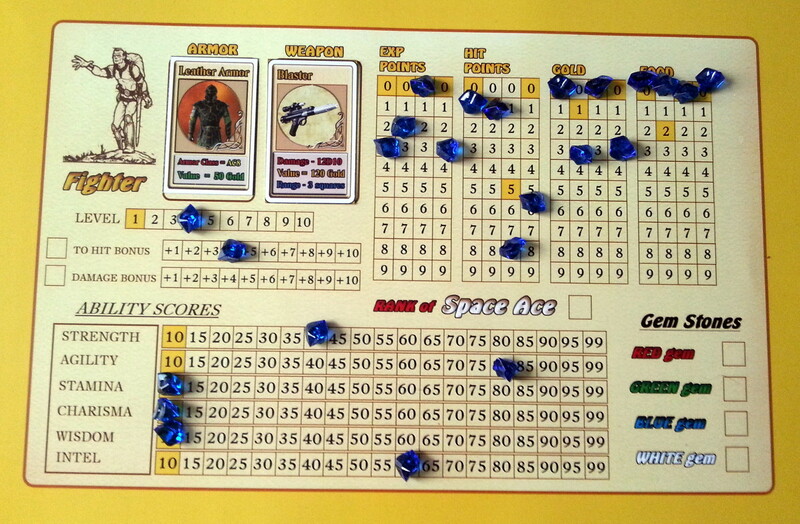 It doesn’t need to mimic Ultima 1 100% faithfully, some elements could be simplified or modified to make it more compelling in the board game medium. Regardless, the effort put into making this game is tremendous and should be applauded. Joe P. here, I’ve actually been working on that idea and to answer your question: Yes, this can be a multi player board game. The way I see it, you could play up to 4 player with each player taking a specific character class; Fighter, Mage, Thief, and Cleric. You just follow the same rules and whenever you have any encounters, you would end up fighting not just one monster but a random number of monsters. ie; draw more monster cards and have the group fight similar as in Ultima 3. I’m working on a board image that you would use to place the wood cubes on to represent the characters and the monsters as they move about. I will try to upload something soon in to the files section in BGG.com. Same would go for dungeon combat, you would fight as a group on a specific dungeon combat map and fight more than one monster! I really think it would work out find and add that much more to the game! I’ll post here when I have the Combat map created. I don’t really see having to change the rules too much to accommodate a multi player format but I will go through the entire rules to make sure. Thanks for the question and interest! 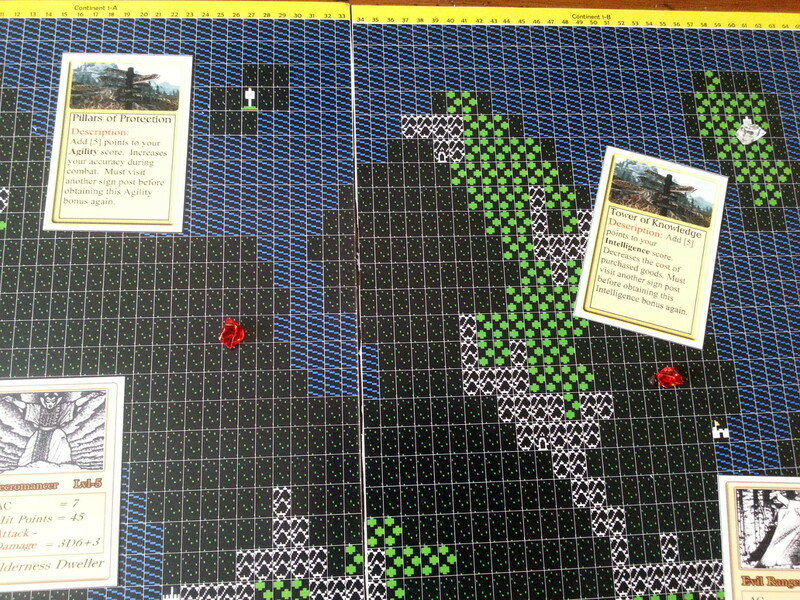 By the way, Richard is doing an excellent job of playing through Ultima 1 the Board Game and in the process he is making the experience entertaining, fun and outright hilarious! I really enjoy this blog and hope it last longer than 4 episodes! One thing that would really help me out is when you finally complete the game and finish your quest of destroying Mondain, maybe you could put together a list of all the issues you found during game play relating to; missing information in rules, game mechanics, problems with combat or movement, inconsistencies with game play or rules, bad mechanics, or just things that need changes in the game or rules to make the game better or run smoother… this would really help me make the final version of the game much better! Since you were deep in the trenches you will have a first hand knowledge of direct issues that cropped up during game play. Thanks for a very entertaining blog so far! Sure, I’ll knock you a list together after I get the last post written up. I’ve mentioned most things as I’ve been going through so there won’t be much you don’t know about. Part 4 is imminent as I’m happy to report that Mondain is an ex-bat. Also, regarding the sigh post quests, all the information regarding what you get per quest is on the actual 8 sign post cards, so this is where you go to see what items or stats are obtained for certain sigh posts. I didn’t add it in the actual rules but I guess I should.